And so... now that Sarah Palin has resigned as Governor who are they going to devour? My biggest question is, where was her Republican back up? Where was the "protecting our own" guys who spoke so boldly at the CPAC '09? What's missing in the illustration above is the warrior elephant stomping the life out of those wolves. It doesn't really matter anymore, Sarah Palin has proven that she's more powerful than a locomotive and she's got a plan bigger than all of her aggressors put together. She blind-sided the main stream media with her resignation speech. 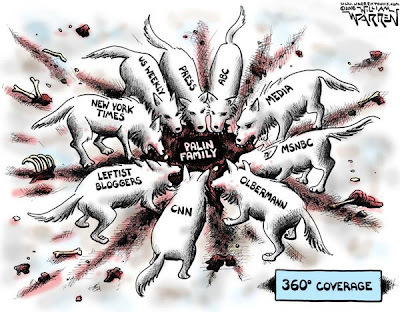 As they were digging up the old worn out issues against Sarah Palin, ready to print and broadcast old garbage in a fresh new wrapping, Sarah rose up and literally stopped the presses and blew away the program directors. They scurried around aimlessly like rats on fire because they didn't have an exit route from the web they tangled themselves in. Everyone speculating, trying to guess what caused this decision and of course came the name calling, suspicions of foul play (immediately knocked down by the FBI). Where was the leak to the media. She messed up the whole process of the main stream media's attempted destruction. She can't govern her state with the professionalism and dedication she's known for because the vultures are distracting her and deliberately creating chaos for her. They don't have that luxury anymore and they're mad! Who are they going to direct all that hatred toward now?? All the other politicians abandon their states and their responsibilities but stay on the payroll while they campaign. She won't do that to the state she loves. I don't know where she's headed but I'm watching and listening. And I'm completely enjoying watching the MSM and liberal bloggers spin because she totally won this round. And I, for one, think that's brilliant!! As the dust settles and the MSM continues to hyperventilate on the anti-Palin withdrawals some good stuff's coming up. "But would it really be so odd if this public servant decided that she had done her bit for her state and her country and that it was time to devote herself to her family and her private pursuits? What’s really disturbing about this whole little drama has less to do with the Governor’s decision to leave office than with the behavior and unspoken assumptions of the press. It has, with only a few exceptions, been a repulsive display. But then what else is new? ~Roger Kimball"
"It's just as clear why the media doesn't get it. Sarah Palin did what pretty much no other politician would do. She did what was right rather than what was politically expedient." "When she took on the crooked Republican politicians in Alaska their trained media chanted it was the end of her political career. Just because "they" say it doesn't make it so. Obviously." "Sarah Palin has a history of doing what is right rather than what is politically expedient. Time will tell whether this was politically smart but it will remain the right decision no matter what. She can hold her head high and be proud of what she sees when see looks in the mirror. Not many politicians can say that. Is it any wonder the pundits don't understand her?" I love that Gateway Pundit calls her, "Sarah Palin Giant Slayer!" How about what the true feminists are trying to sort through, "Feminists and the Mystery of Sarah Palin" by Violet Socks. Sarah Palin’s stunning revelation this past weekend is nothing short of revolutionary. 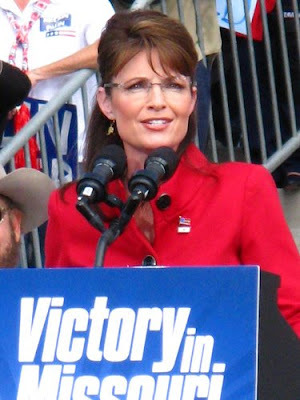 Friday, Sarah Palin not only announced her somewhat expected decision to not seek reelection, but to also delegate her power and title as governor to Lieutenant Governor Sean Parnell immediately. This has sent the media into a frenzy, digging and probing for whatever they can to explain her decision and digest this abrupt shock, often with the intent of “getting the dirt” on Palin. (Revealing that everyone already has her well in mind for 2012…) While other elected public servants are griping about not getting the respect they apparently deserve and are entitled to by “working so hard” to muster up the support they should already have from their constituents, Sarah Palin has delivered a striking blow to the machine by not falling in step and line with that sort of career building strategy. Instead she has chosen to do what is right—irrespective of any plans she may or may not have for herself. As expected, her rivals and critics will play this up as folding to pressure. “It’s too good to be true—we’ve won!” they’ll say. “She couldn’t handle the ‘full-court press’ after all…” Except, we all know very well that that’s not the case. Not even close. It is too good to be true. There was no “rambling” or “incoherence” whatsoever in her remarks. Apparently Sarah Palin speaks in “code” only understood by those who understand what public service is supposed to be. Maybe they missed the straightforward explanation she delivered herself, (or maybe it’s just wishful thinking…), but Palin is not retreating. Her intentions are clear. It’s a clever and strategic move. No one ever expected her to buckle, because they knew she wouldn’t. Her opponents did think they had her in a vice of endless accusations and political harassment though—with the intent to compromise the effectiveness of her administration and the integrity of her name. To a degree, it was working…except for one little problem—it was too late. Sarah Palin has already done what she set out to do in Alaska, so she had a choice: Wait it out at the expense of the state, battling unprecedented forms of defamatory accusations, unable to make any progress; or take the opportunity to entrust her legacy to Lieutenant Governor Parnell and free herself to move on to address bigger and more consequential concerns that are important to both her constituents in Alaska, and her supporters across the nation. She recognizes what she must do to restore effectiveness to her administration. She sees a window of opportunity, and she understands that the time to act is now—2010 is quickly approaching. Now that she’s been thrust into this position of national leadership, she knows that she can afford to make this kind of sacrifice. “She became a national figure – an international figure during the last presidential race. ... What that means is that she not only had the local press after her, the local party after her, she had the national – national candidates, national party, after her – international, perhaps, even,” in the words of her trusted successor Sean Parnell. “She doesn't need a title to effect change and bring some hope to people who need it.” The way I see it, her first priority will be 2010 elections, and helping to secure as many seats as possible for conservative candidates who share her resolve. She will be setting the stage for a conservative comeback, and building a league of support and teamwork, while in the background, preparing for a bigger potential battle of her own, perhaps… She’s taken on the role of “Joan of Arc” for conservatives. She’s on her own, but she knows what she’s doing. And regardless of what she has planned, where’s the outrage when a public servant leaves their post to, say, campaign for president? Are they “abandoning” their constituents? When we elect our representation, we elect their judgment. It was Palin’s call to “pass the ball,” and we know it’s not in her interests of her “career”, but if she’s doing it for her supporters and her constituents, it will ultimately serve her potential to do so. The fact that her resolve is original, doesn’t make it wrong. It’s just not reasonable to conclude that she’s quit, or abandoned her post…especially without reading her own statement. It’s a game changer, but she most definitely hasn’t left the game. She’s made that clear. As for the onslaught of complaints directed toward her administration… These aren’t about serving the people, or about holding public servants accountable—it is just a political weapon intended to block her progress and success, and defame her name and integrity. There comes a time when it’s appropriate to question the ethics of the ethics charges. And they thought they had her cornered…but Sarah Palin is not restricted by the laws of machine politics. With this bold and startling initiative, her critics are left scratching their heads—she shook them. They’ve lost her trail. They can’t understand that a politician actually be driven by a motivation to serve her people, over a motivation to cling to a title that boosts her “experience” and promotes her career, according to systematic expectations. Sarah Palin doesn’t have the army of support she has by taking that conventional “career-building” approach. Her support comes from her apparent drive to do what’s right for her people. And to me, that’s a lot more meaningful than the title of governor. She’s not committed to politics or expectations—she’s committed to her people, and exercises her judgment accordingly. Unfortunately, critics can get away with using “she quit” against her, as if there’s any question about her level of commitment…but they fail to explain how this is going to negatively impact her constituents and supporters. We do know how it’s going to help them, however. We don’t need restrained, tainted, or confined judgment representing us on state level, much less national government. We don’t need candidates who are committed to uselessness and complacency. We need candidates who can think outside the box to do what’s best for their people. She’s not concerned with convincing anyone of her ability, and she’s got nothing to prove—she lets her actions speak for themselves. And let’s face it: sixteen more months as a lame duck governor isn’t going to convince her skeptics and critics of anything, anyway. And as for the critics that will now question her experience yet again, since she refused to stick around and finish the term with nothing to do but attract negative attention to the governor’s office in Alaska, I will just say this. I’ll take the candidate that took the “unconventional” and “uncomfortable” approach and actually made great things happen for her people in three years, over the candidate who held a post in the systematic political machine of status quo for the past twenty years any day. And I’ll take the contender who has demonstrated that their conviction and devotion lies with their people, over one that pursues a title that will boost their career credentials, any day. We’ve learned to measure experience by time and title—hardly indicative of competence and ability. We’ve learned to value the confines of political expectations and parameters that have no actual bearing on the well being of constituents of the effectiveness or ability of the public servant. Why has it become so hard to recognize actual decisions and actions that deserve merit? With that kind of expectation for our public servants, it’s no wonder their performance has been lacking. Sarah Palin works outside those parameters, and I support that. So while some will be left to fume in bewilderment and scorn by Sarah’s “erratic” or “senseless” behavior, (since she couldn’t possibly have a good reason or intelligent approach…) and while the complacent Republicans who have been instrumental in bringing conservativism to its knees will express their disappointment in her decision and senselessly condemn her future…Sarah Palin will be preparing for a pivotal role in the future of the United States. Stay tuned." And from the Sarah Palin Blog: "Sarah Palin IS the New Voice of the Republican Party"
"On this Independence Day, I am so very proud of all those who have chosen to serve our great nation and I honor their selflessness and the sacrifices of their families, too. If I may, I would like to take a moment to reflect on the last 24 hours and share my thoughts with you. First, I want to thank you for your support and hard work on the values we share. Those values led me to the decision my family and I made. Yesterday, my family and I announced a decision that is in Alaska’s best interest and it always feels good to do what is right. We have accomplished more during this one term than most governors do in two – and I am proud of the great team that helped to build these wonderful successes. Energy independence and national security, fiscal restraint, smaller government, and local control have been my priorities and will remain my priorities. For months now, I have consulted with friends and family, and with the Lieutenant Governor, about what is best for our wonderful state. I even made a few administrative changes over that course in time in preparation for yesterday. We have accomplished so much and there’s much more to do, but my family and I determined after prayerful consideration that sacrificing my title helps Alaska most. And once I decided not to run for re-election, my decision was that much easier – I’ve never been one to waste time or resources. Those who know me know this is the right decision and obvious decision at that, including Senator John McCain. I thank him for his kind, insightful comments. The response in the main stream media has been most predictable, ironic, and as always, detached from the lives of ordinary Americans who are sick of the “politics of personal destruction”. How sad that Washington and the media will never understand; it’s about country. And though it's honorable for countless others to leave their positions for a higher calling and without finishing a term, of course we know by now, for some reason a different standard applies for the decisions I make. But every American understands what it takes to make a decision because it’s right for all, including your family. I shared with you yesterday my heartfelt and candid reasons for this change; I’ve never thought I needed a title before one’s name to forge progress in America. I am now looking ahead and how we can advance this country together with our values of less government intervention, greater energy independence, stronger national security, and much-needed fiscal restraint. I hope you will join me. Now is the time to rebuild and help our nation achieve greatness! God bless you! And I look forward to making a difference – with you! Sarah" Oh yeah... I look forward to making a difference too. And I will be watching and joining in on any activity Sarah Palin sets in motion. One day we'll stop saying that Palin is the next Ronald Reagan. Instead, we'll say Reagan was an early Palin.